Since their establishment in 1936, the Governor General’s Literary Awards have served as Canada’s premier literary honour. Yet over the years, the awards often have been noted as much for their controversy as for the writing they’ve sought to recognize. From January 4 – January 31, 2012, UBC Library will host a display highlighting some of the more contentious episodes that have taken place during the awards’ first 75 years. 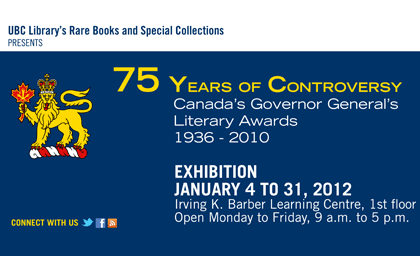 75 Years of Controversy will be held in the Rare Books and Special Collections division, located on level one of the Irving K. Barber Learning Centre on UBC’s Vancouver campus. The exhibition is free and open to all.